Dropped the kids off at Jeff's and then went to the gym. I managed 12 1/2 minutes on the recumbent bike before I got a foot cramp and started feeling nauseous. Finished the 3 minute cool-down, so I basically did 2.5 miles in 15 minutes. Then I headed for the weights. I managed the adductor, the abductor, the seated cable pull and the lateral pull-down before I felt so sick I thought I was going to throw up... I think I just overheated (the gym is air conditioned, but it's all west-facing windows, and it was 5pm) so I quit after 35 minutes. 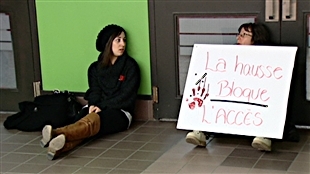 Her sign says "La hausse a bloqué l'accès". In the plus column, however, I now have a family doctor (the kids are still on a waiting list for a pediatrician). I've got my first appointment with her on April 18, and I'm thrilled! It's been EIGHT YEARS! 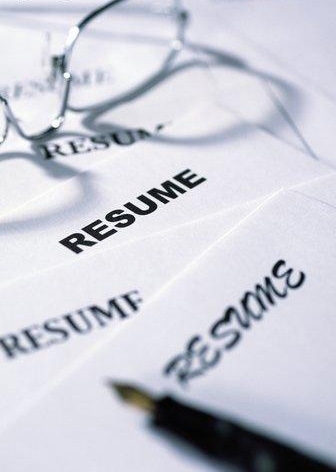 I think there's a fundamental problem with the way Quebec's ministry of health is run when there's such a shortage of medical personnel (mainly due to language restrictions - all doctors, nurses and other professionals must pass a French exam in order to be licensed to work in Quebec). I won't get into politics here, but it irks me greatly. The baby cardigan is complete save a few ends to sew in, and the neckband to finish (four rows of garter stitch... I could probably do it before I go to bed). The curtain is moving along. Not quickly, and I've revised my goal of finishing it by Easter. I'll be happy if I have it finished by the time Rob comes back in June :) (a bit more realistic given the fact that I have two papers to write for my class before April 16 and a final exam on that same date). I am looking forward to rewarding myself with some sock knitting :) I wanted to take a class, but I'm saving up for Stitches Midwest and for the Yarn Harlot's visit to Perth in August! Besides, Stephanie teaches a mean sock class, I'm told, and I'd rather take hers! Here's hoping that a good night's sleep will make everything seem more manageable in the morning. Sorry I never responded to your text last night, was asleep already *blush* Sorry about work and school, must be really frustrating *hug* But yay for finally getting your hands on a family doctor, I know you've been trying to do that since I first met you, and probably before!